A couple quick rides that I want to do to get ready and see how I do with riding longer distances and times will be some quick day trips. Kentucky Bourbon Trail – well, minus the tastings. There is a lot of road to cover here, and most is back roads. Near Woodford Reserve distillery is an old abandoned distillery. I have been there before with a photo club, and we were allowed to go in and take photos. Besides, bikes and bourbon! There are really 2 different rides that can be made out of these. Madison, Indiana. This one is one I have done on a photo trip before as well. Drive up and over the bridge in Louisville, and get off the expressway at exit 0. Then, follow Highway 62 (aka Ohio River Scenic Road) past the Naval Ordinance and into Madison. I think that route takes about 90 to 100 minutes. Then do whatever around Madison – there is a nice state park just outside the town. For the way home, come across the bridge at Madison and follow the road until it hits US 42 and ride it into Prospect. That route is slightly shorter at about 80 minutes. Bloomington, IN and Lake Monroe. This would be an overnight ride, simply to see everything and break up the driving. The route is pretty simple. I-64 across the bridge and get off at the Georgetown exit. Follow 37 up to Paoli and then head north towards Indianapolis. Along the way the route passes right by Spring Mill State Park. This is a great place to do a bit of hiking or just riding around. There are numerous caves and a neat pioneer village to walk about in. After that, head out to the highway again north. Once through Bedford, Lake Monroe’s first area will be just north. Not a lot of riding here, but it is where I know I will be storing some of the gear, as this is where I will be spending the night later on. I have a sailboat here that will sleep 6 comfortable, 8 with some cuddling and more if they want to sleep on deck. Head from there into Bloomington for food and a bit of walk about. Coming home the next day will offer the choice of going the same route, or one of 30 different ways. One of them will go through Brown County and Hoosier national forest. There is a way to come through Seymore and visit the wildlife reserve. For me, the first time, I will probably come back the same way I went up. Eventually, I would want to do longer, multi-night trips. Gatlinburg, Myrtle Beach and eventually Route 66. 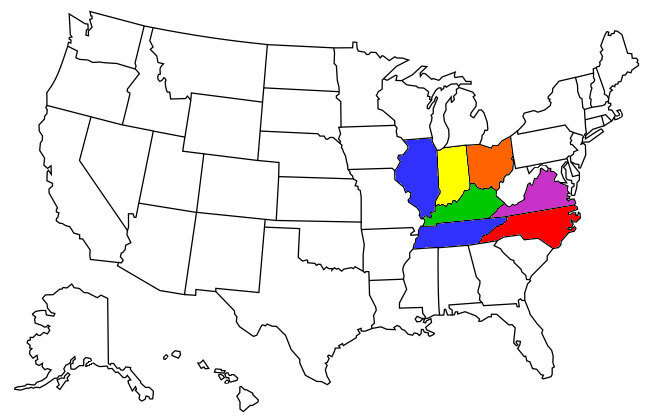 This fall I want to get into some of the Appalachians and see the colors and mountains and into Pennsylvania. Once I get proper saddlebags, it will be cake and a no-brainer. At just under 4 gallons for a complete fill-up, I can get avg 300 miles. There is give and take depending on conditions, load and stuff, but much better than my car in any case. There are others I could list but then this post would go on forever. I would rather be riding these, but that time will come. Until then, keep the batteries charges and the chains oiled. Any ride is a good ride! I remember one trip to Gettysburg in June. That is nice plush green country out that way. Forget about the hotel, find a place to park and sleep somewhere at the battlefield and watch for ghosts. Just don’t get arrested. Many people say Gettysburg is the most haunted place in America, plus a perfect place to read.